Lately I’ve been thinking a lot about Lebanon, and over the past month as I’ve cooked up delicious Lebanese dishes with Mama, I have found myself longing more than ever before for a taste of it, for the experience of walking through the souk, eating a manoushi bi zaatar fresh out of the bakery oven, picking fresh mint out of the garden or sweet figs off a tree. I was only 8 years old when we immigrated to Canada, and I have yet to return, but I have vivid memories of sitting on the terrace of my grandparents home to have breakfast, which turned into lunch and then dinner, it was a feast that never ended. I still recall the women in my family picking leaves off the grape vines the day before and spending hours in the kitchen cooking up meals which included Mujaddara, Tabbouleh, Hummus bi Tahini, Babaghanoush, and Warak Arish Mahshi among other amazingly delicious dishes. I sometimes wonder if our early childhood memories are real, or if they are based on stories we’ve been told. 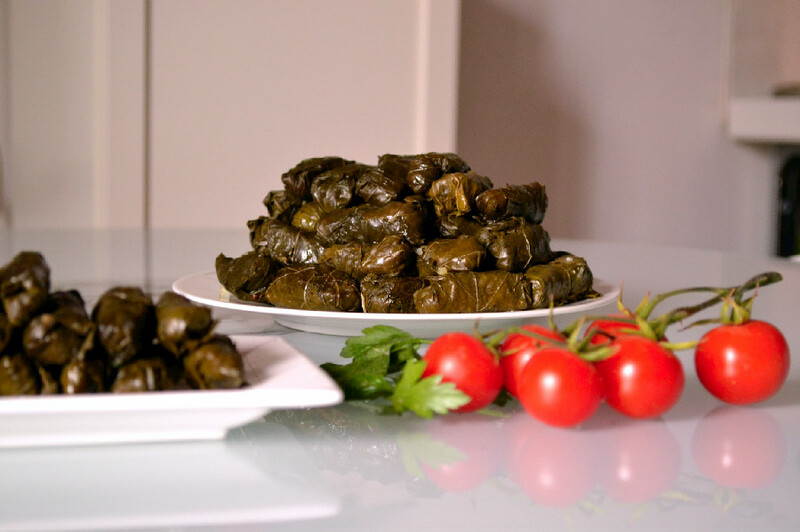 Warak Arish Mahshi or stuffed grape vine leaves are a popular middle eastern dish that you have most like heard about, seen or tried at some point. If you haven’t tried them, get ready to start rolling or get to your neighbourhood middle eastern restaurant ASAP cause you’re missing out. 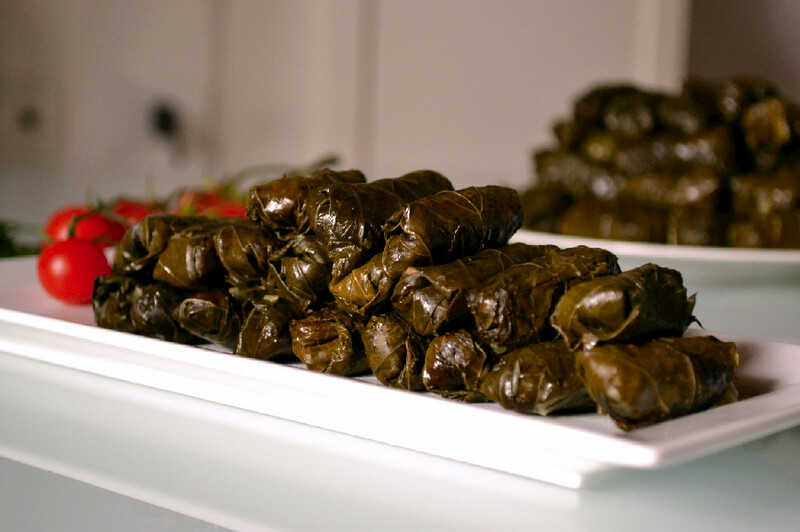 The Greeks call them Dolmades and the Turkish refer to them as Dolma while the Lebanese know them as Warak Arish Mahshi – warak meaning leaves, arish meaning vine, and mahshi meaning stuffed, hence stuffed vine leaves or stuffed grape leaves. The traditional Lebanese recipe is made with white rice and lamb or beef and served with yogurt. But they can also be made meatless, as we’ve made them here. Another one of Mama’s vegan adaptations of a Lebanese classic. We used grape leaves conserved in salt water which Mama says she prefers as they tend to be more tender. Back in Lebanon, they used to pick them in the late Spring and conserve them in jars of salt water for use all year round. This recipe is a childhood favourite and a comfort food I crave regularly. What’s your comfort food? 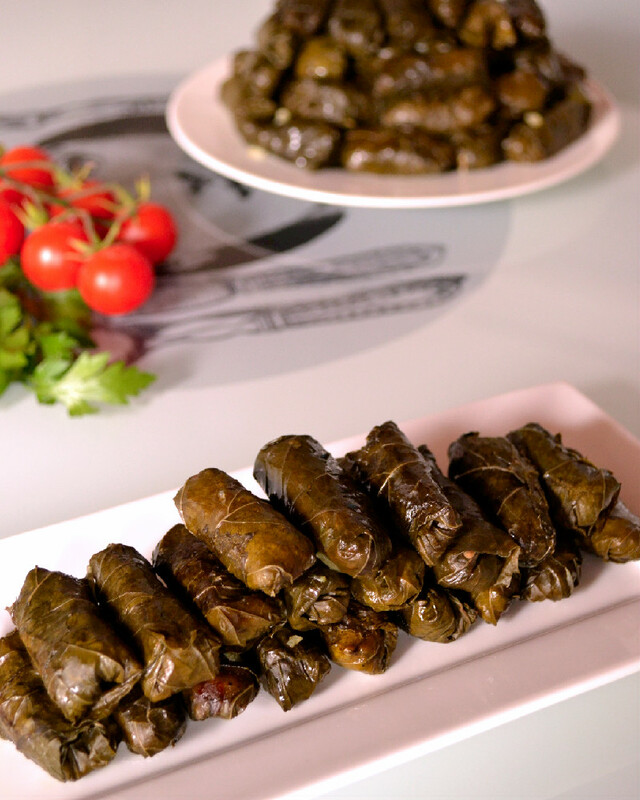 Neatly arrange the stuffed and rolled grape leaves in rows, alternating directions, to completely cover the circumference of the pot, in as many layers as necessary until you have rolled and arranged all of them. Drizzle 1/2 tablespoon of EVOO between layers and on top. They can be served hot, warm, cold or at room temperature and are traditionally dipped in yogurt and eaten with pita bread. For a vegan alternative, try dipping them in a vegan yogurt or hummus bi tahini spread. I love stuffed grape leaves, yum! Me too! One of my ultimate comfort foods! OK, sold. Will look for grape leaves ASAP ❤ They sound like an interesting thing to make from scratch. My mother-in-law taught me to like them and I’ve been hooked since, but only order them when we eat out. I’ve been thinking about how to make stuffed grape leaves with brown rice. Thought I would need to parboil, but then wondered about completing the process so the rice did not cook to mush. So glad you did the hard work for me! Can’t wait to try these. Hope you enjoy it Kathy. If you want to skip the parboil, soak the rice overnight for at least 12 hrs and it will have the same effect. Ever since i started soaking my whole grains i no longer need to parboil for this or risotto.